On tonight's episode of Food Network Star the remaining contestants each got a name of a dish from Food Network Magazine editor Maile Carpenter and had to create a dish based on that name. Whoever did the best at this challenge would receive and advantage in the following challenge. That challenge was to shoot a promo for a show called Family Road Trip and the contestants had to work in pairs. Actress Ali Larter was there to help Bobby Flay, Giada De Laurentiis and Maile Carpenter judge the episode. Tregaye received the advantage and that gave her the advantage of picking her own co-host while also pairing up everybody else. She picked Yaku and made the other teams: Ana and Martita, Damiano and Erin, Jernard and Joy, and Monterey and Rob. The judges decided that the winning team was Jernard and Joy and they would be safe from elimination. The bottom two teams were Ana and Martita and Tregaye and Yaku. 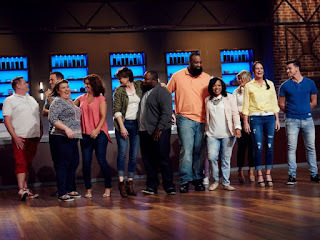 After deliberation, the judges decided that Martita Jara would be eliminated from Food Network Star for the second time. Martita will go on to compete in Star Salvation which begins next week.